Faculty, staff, and students interested in attending Curriculum Committee meetings should contact the Committee Secretary, Candace Miller (umecc@queensu.ca), for information relating to agenda items and meeting schedules. A meeting of the Curriculum Committee was held on October 26, 2017. To review the topics discussed at this meeting, please click HERE to view the agenda. Faculty interested in reviewing the minutes of the October meeting can click HERE to be taken to the Curriculum Committee’s page located on the Faculty Resources Community of MEdTech Central. Those who are directly impacted by any decisions made by the Curriculum Committee have been notified via email. Students interested in the outcome of a decision or discussion are welcome to contact the Aesculapian Society’s Vice President, Academic, Justine Ring at vpacademic@qmed.ca. What’s the purpose of universities? There appears to be no simple answer to what might seem to be a straightforward question. The pragmatic, contemporary purpose would be to prepare young people for careers of various types. Certainly that would be the likely first response of most current students, and postgraduate employment has become a key (and very public) metric of university success. These greater goals require universities to provide environments where both students and faculty feel free to explore any and all topics openly, freely and safely. 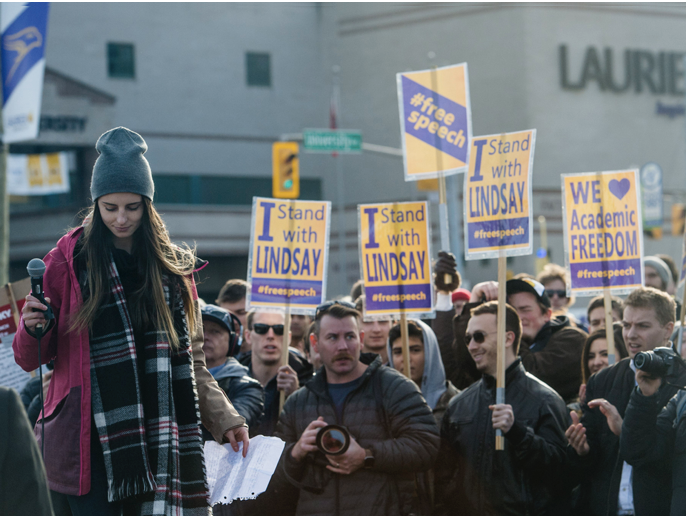 Lindsay Shepherd’s recent experience with her university hierarchy would suggest we have some work to do if those lofty goals are to be achieved. For those not yet familiar with her story, she is a 22 year old teaching assistant at an Ontario university who is undertaking a master’s degree in Communications. A few weeks ago, a student (or students, we don’t know) in her class complained that she was using material they found offensive. The offensive material consisted of a three minute video clip that had been broadcast on TVO and featured a debate about the use of non-gender, contrived pronouns, featuring Professor Jordan Peterson, a highly controversial psychologist and university professor who characterizes himself as a defender of free speech but whose views on social issues have been seen as “far right” and highly threatening by many. For this offense, Ms. Shepherd was required to attend a meeting with her supervisor, another professor, and a university official who holds a position as director of gender violence prevention and support. She recorded the meeting, and made that recording publicly available. Although it’s somewhat painful to listen to, it holds important lessons for those holding positions of authority in universities or colleges. Through the 40+ minute session, the three senior university officials take turns trying to convince this young woman of the error of her ways. It’s clear that the intention of the meeting was not to get Ms. Shepherd’s perspective on the events, but to convince her that she was guilty of using an inappropriate teaching approach and disseminating offensive material. It appears that guilt had already been established through nothing more than the evidence of the student complaint. Why else would the director of gender violence prevention and support be already involved in the matter? In their defense, they appeared to be sincere in their beliefs that the material was intrinsically offensive and in questioning of the choice of methodology given the purpose of the teaching session. They also appeared to be trying to avoid any reputational damage to their institution. For her part, Ms. Shepherd was unrepentant and consistent in defending the use of provocative material to stimulate what she believed to be healthy debate. She felt young people should be prepared to hear and engage differing and even radical opinions. She made it clear that she herself did not agree with the views of Professor Petersen and was in no way endorsing his point of view. She was, throughout what was obviously a highly uncomfortable and fundamentally unfair encounter, principled and courageous. As I listed to the encounter, I couldn’t help but think that her parents would be proud of her. There has been, as you might imagine, considerable backlash. Editorials, student protests and national columnists have defended Ms. Shepherd and attacked the university for how this issue was handled. The individuals involved and university president promptly issued apologies. I decided to write on this issue not because Ms. Shepherd requires further defending, nor to add to the vilification of those involved – the fundamental unfairness of the encounter itself requires no further comment. However, I think this regrettable incident offers important lessons for those of us who teach and hold positions of authority at the university level. If universities are to truly provide more than simple vocational training, they must establish safe and welcoming environments for students and faculty of all background and beliefs. They must foster, indeed welcome, new and even radical ideas. To do so, they must strike a delicate balance between free speech and personal harassment. When does one person’s expressed opinion become unacceptable? A standard we might all accept is when the expression of those views harms or threatens another individual or group. In most cases this is self-evident. But (and this is a big “but”), harm or threat can be a subjective experience. Were the students who complained to university official about Ms. Shepherd’s tutorial harmed or threatened by hearing the video clip she presented to them? On perhaps another extreme, the University of Chicago appointed a Committee on Freedom of Expression in 2014. The University of Chicago approach would seem to be appropriate given American values and their current political-social environment. But how are we to negotiate the delicate balance of free expression and personal rights in the Canadian context, given our collective recognition of minority oppression, and natural inclination to civility and compromise? In the university environment, there are additional motivations to protect young people who we may see as vulnerable, and to guard our institutional interests. There are no easy answers, but I believe Ms. Shepherd’s experience provides warning that the pendulum may have swung too far toward toward suppression of vigorous and healthy debate in the interest of avoiding any potential appearance of offense. In our universities, where open and free discourse should be encouraged as a key goal, this is particularly alarming. Ultimately, we must re-examine what serves the interests of our students and society, and what keeps our universities vital institutions where personal growth and von Humboldt’s “common search for truth” can truly flourish. Faculty and staff interested in attending Curriculum Committee meetings should contact the Committee Secretary, Candace Miller (umecc@queensu.ca), for information relating to agenda items and meeting schedules. A meeting of the Curriculum Committee was held on September 28, 2017. To review the topics discussed at this meeting, please click HERE to view the agenda. Faculty interested in reviewing the minutes of the September meeting can click HERE to be taken to the Curriculum Committee’s page located on the Faculty Resources Community of MEdTech Central. This was the tongue-in-cheek question I posed to my classmates at our medical school reunion last year. They were rather amused by it and, being very much aware of the high academic standards required by our current admissions processes, believed the answer was an obvious “no”. I tried to raise some doubt arguing (with what I thought at the time was more fantasy than reality) that our marks, like the dollar, had been “devalued” over the years. They weren’t really buying it. However, I’ve since come to learn that what I thought at the time was fanciful conjecture was closer to truth than I realized. To those of us less financially sophisticated, it basically means a dollar doesn’t buy as much as it used to. The important corollary is that the amount of money we possess or earn becomes progressively less valuable as its purchasing power steadily diminishes. It’s perhaps a little surprising to find the same term applied to academic grades. In fact, considerable information is available on the topic, which has been termed by some as the “dirty little secret” of university and college academic programs. And so, a closer look at the phenomenon would seem to be in order. With the capable assistance of Sarah Wickett, Health Sciences Librarian, we identified a few key papers to shed a little more light on the topic. We set out to address three questions: Is there real evidence of grade inflation? If so, what are the causes? Does it matter? The average GPA rose in 11 of the 12 courses. Of the 80 course-university combinations studied, 53% had grade inflation of at least 10%, 31% had no statistically significant change, and grades fell in 16%. The rate of inflation was not uniform, with the greatest increases occurring in English, Biology and Chemistry. The percentage of students receiving an “A” increased overall from 16% in 1974 to 21% in 1994, while the percentage receiving “F”s declined from 9.5% to 6.7% during the same time. This trend was true in 11 of the 12 courses of study, with Sociology being the only exception. English, Biology, Music and French have the greatest increases at the upper end of the distribution. In Biology courses, for example, the percentage of students getting “A”s increased from 12.8 to 22.6%, while the percentage receiving “F”s declined from 9.1 to 5.7%. The variance, or distribution of marks, within courses declined or stayed the same in all courses. In other words, the “bandwidth” between high and low achievement tended to diminish. This phenomenon does not appear to unique to Ontario. In Studies in Higher Education (2017, 42:8;1580) Dr. Ray Buchan of the University of Brighton reports on the proportion of “good” or Honour degrees awarded by 100 universities in the United Kingdom. He reports an increase from 47.3% in 1994/95 to 61.4% in 2011/12, which in absolute terms represents an increase of 113%. Perhaps more significantly, the proportion of “first-class” degrees awarded more than doubled over the same time, increasing from 7 to 15.8%. In his article he quotes the Universities Minister David Willets who states: “the whole system of degree classification does need reform”. There has been considerable study of this issue in American universities. 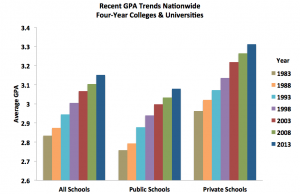 Dr. Stuart Rojstaczer reported on 29 schools, showing and increase of 0.15 points on the 4 point GPA scale since the 1960s, with greater rates on increase in private versus public schools (Grade Inflation at American colleges and universities. Available at www.gradeinflation.com). The University of Arkansas was concerned enough about grade inflation that it commissioned a Task Force on Grades in 2004 to examine the phenomenon. The results, reported by Mulvenon and Ferritor (International Journal of Learning 2005/2006;12(6):55) confirm steadily increasing undergraduate GPAs, increasing from 2.76 to 2.95 between 1992-93 and 2003-04. Possibility 1: The students are better prepared. Over the years, young people have had greater access to early education and have been exposed to more advanced educational methodologies. They have also had the benefit of rapidly expanding technology that not only enhances their educational experience but also enables them to access information and learning much more continuously and easily. In fact, young people are literally immersed in learning opportunities, both inside and outside the classroom. They have also had opportunities to engage more intellectually stimulating extra-curricular learning opportunities, both through the educational system and their private lives. Perhaps all this has resulted in young people who begin their post-secondary education with considerable advantages relative to their predecessors. Possibility 2: Universities and colleges are doing a better job of educating. There has certainly been an increased emphasis on teaching at most colleges and universities. Faculty are expected to have real teaching skills and qualifications, which are sought after and recognized. They have also benefited greatly from advances in educational methodologies and technologic advances. Possibility 3: It’s just easier for everyone involved to give good marks. We therefore have a “virtuous cycle” which would, on the surface, appear to be a “win-win” for all involved. The course, program and institution also benefit in an environment where pass rates are seen as a key marker of success (eg. Macleans magazine rankings) and students are drawn to places where they are more likely to achieve high grades that will make them more competitive for graduate studies and eventual employment. Unfortunately, there’s been much less investigation into the causes of grade inflation. However, there have been some interesting analyses. In an intriguing article entitled “Whose fault is it?” R.T. Jewell and colleagues attempt to determine whether higher grades are related to improved academic aptitude of students or changing practices among university teachers (Applied Economics 2013; 45: 1185). Using data from 1683 separate courses taught in 28 different departments by 3176 instructors at a large public university over a 20 year period they develop a series of complex mathematical models that leads them to conclude that “the average GPA in our sample…increased by 0.1459 grade points due solely to unobservable instructor characteristics.” They go on to identify instructor-specific issues as the main determinants of grade inflation. Their analysis did not allow them to be more specific about the nature of those characteristics. And so, it would appear that the third cause where students, faculty and universities all benefit from a more liberal distribution of grades is at least a contributor. In one respect, it might be tempting to shrug this off as a “win-win-win” situation, in which students benefit, teaching faculty avoid the inherently difficult and stressful task of comparing and quantitating differences in the accomplishment of their learners, and institutions can develop flattering metrics that keep them competitive. Fairness. The truly outstanding and highly committed students get lost amid all the high marks. Some of those A’s really are A’s, but can’t be distinguished from those that perhaps shouldn’t be. Misconceptions among students. Grade inflation may be giving students misinformation regarding their strengths and weaknesses, and therefore leading them to inappropriate career decisions. Confusion on the part of downstream programs and potential employers. Providing misleading academic profiles can lead to poor selections, which, ultimately, are unfortunate and potentially very damaging for all involved. What may seem like a charitable act can therefore turn out to be quite the opposite. If that group stemmed the tide, it would appear from recent studies that the issue has re-emerged. Getting back to the question I initially posed at the beginning of this article, all this may provide some solace to my classmates, but as an institution that prides itself on high standards and academic excellence, should we be concerned? Many thanks to Sarah Wickett, Health Informatics Librarian, Bracken Library, for her valuable assistance in the compilation of information for this article. It’s a unique and interesting thing being one of the non-medically-trained employees who work (mostly behind the scenes) to help run the undergraduate medical education program at Queen’s. On the one hand, friends and family can sometimes think I’ve magically completed medical school in the types of questions they ask me. (I only work there, I say). On the other, through day-to-day interactions, I have absorbed terminology and “insider” information. A new resident was surprised when, during a follow-up visit, I referred to my condition by name (gastroesophageal reflux disease), rather than calling it heartburn. “Most people don’t call it that,” she observed with surprise. I’d just done a curricular search for where and when we teach it – and at the earlier visit, that’s the term they used, so I paid attention. I can find my way around most of HDH and most of KGH most of the time. And I know there are THREE hospitals in Kingston, not two. 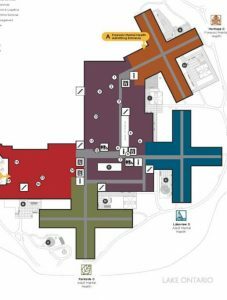 (I just haven’t figured out the new Providence Care layout yet.) I’ve learned the “logic” of the multiple wings, the naming conventions, and – when all else fails – where to find the volunteer desk to ask directions. I now know that what you think something is might not be what it actually is. Case in point: My colleague’s son was diagnosed with OCD – but he’s not the least bit obsessive, so how does he have obsessive compulsive disorder? There’s another OCD, diagnosed by orthopedic specialists: Osteochondritis Dissecans of the knee. (It also stands for Ontario College Diploma, but that’s another story). Facebook thinks I’m a doctor. No, really, I get ads for MD Financial Management services, and medical conference. It’s based on analytics harvested from my Google searches (because everything is frighteningly linked these days). I search for things to assist with curriculum development, and voila! Facebook has changed my profession. 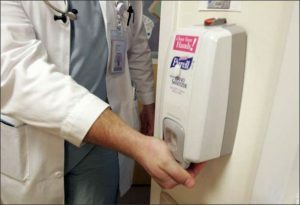 I actually use those ubiquitous hand sanitizer dispensers while entering and leaving the hospitals. Every single time. When you’re “inside” you can forget what it’s like to be “outside”: how can remembering this influence communication, for example, in explaining acronyms, procedures, or what happens next? There’s power in language and understanding. When we’re familiar with buildings and facilities, it’s easy to forget what it’s like to be in an unfamiliar place and worried about getting around. How can we make instructions and directions as clear as possible? Don’t assume. If you’re not sure: ask. For example, we’re talking a lot about EPAs lately in undergraduate medicine. We don’t mean the US Environmental Protection Agency, but Entrustable Professional Activities. Even if we’re trying hard to adhere to my suggestion #1, we might slip up. Speak up and ask for clarification. Facebook still thinks I’m a doctor now and again, but more recently it’s promoting space-saving storage ideas and junk removal services. (I’m still adjusting to our downsized townhouse, 15-months in). The lesson here: We leave digital footprints everywhere we go. Intentionally (e.g. through public Twitter posts) or unintentionally through Google searches, nothing we do online is private. How should this influence what we do and how we do it? Paper cuts and hangnails do not like hand sanitizer. At all. Ever. Be careful. Here’s to the next five years.